Debating London’s economy: can the global city be a city for all? 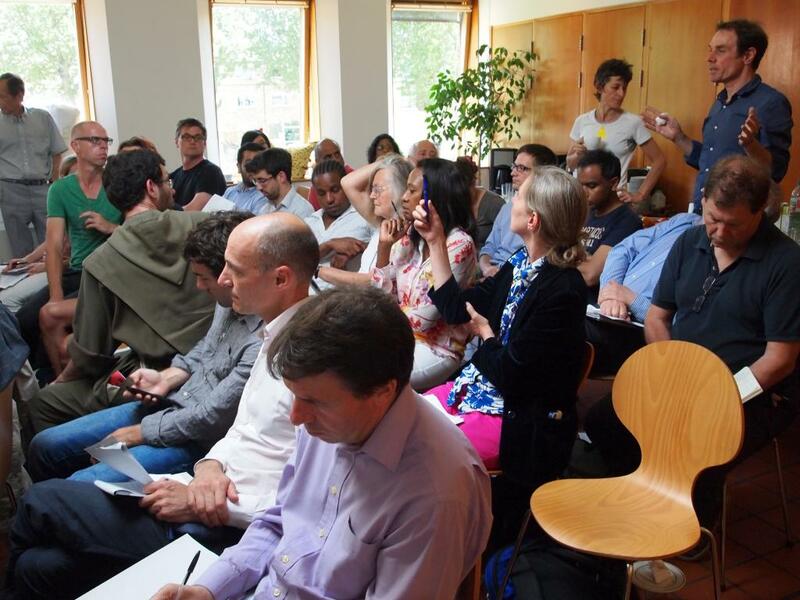 On Monday 14 July, a remarkably diverse group of over 50 people – citizens and politicians, trade unionists and entrepreneurs, academics and activists – gathered to explore whether and how London can reconcile its global ambitions with the needs of Londoners. Taking place at Bromley by Bow Centre, the location symbolised some of these challenges, sitting alongside both Canary Wharf and housing estates with the highest level of child poverty in the UK. On the agenda were issues presently being neglected by the Mayor of London and the London Enterprise Panel: climate change, industrial activities, gender equality, small businesses, ethnic diversity and migrant economies, affordable workspace and social enterprise. Organised by the Just Space Economy and Planning group, the event demonstrated the need for policy-makers to look beyond the ‘usual suspects’ – developers, financial services and big business – for the evidence, experience and ideas they will need to make London a city for all. Further events, activities and networking are planned in order to build a broader platform of engagement on strategic planning and economic development in London. – Programme and presentations available: James Meadway, nef; Diane Perrons, LSE; Patria Roman, Latin Elephant; Rachel Laurence, nef (slides and project summary). – View photos and a summary of twitter activity from the event. Just Space Economy and Planning (JSEP) formed in 2013 in order to build capacity within the Just Space London-wide network of community groups to participate in planning on economic issues. Further information at https://justspacelondon.files.wordpress.com/2013/11/131128-jsep-statement-of-intent-final.pdf and https://justspace.org.uk/about/. ‘London for all: opening up debate on London’s economy’ was held on Monday 14 July at Bromley by Bow Centre. Speakers included Jenny Jones (Chair of London Assembly Economy Committee), Sue Terpilowski (London Policy Spokesperson, Federation of Small Businesses), James Meadway and Rachel Laurence (new economics foundation), Diane Perrons (London School of Economics), Jack Hibberd (Truman’s Beer and East End Trades Guild) and Laurie Heselden (TUC London Region). The event was chaired by David Fell (London Remade). Further details at https://justspace.org.uk/2014/07/02/london-for-all-opening-up-debate-on-londons-economy/. A ‘storify’ of the Twitter activity around the event is at https://storify.com/myfanwy_t/london-for-all-opening-up-debate-on-london-s-econo. Photos at http://s1370.photobucket.com/user/JSEP/library/London for All event 14 July 2014. By engaging with a more diverse range of groups, JSEP has already uncovered evidence of the under-represented economies locating in London’s high streets, affordable office spaces and industrial areas. JSEP is concerned that the Mayor’s proposed changes to the London Plan are likely to squeeze out these activities, posing severe risks to the prospects of achieving a more inclusive and sustainable London economy (https://justspacelondon.files.wordpress.com/2014/04/falp-jsep-response.pdf). JSEP is also concerned that the Economic Development Plan being developed by the London Enterprise Panel does not deal with issues of sustainability and inclusion, and has largely been developed in private with no community involvement (https://www.london.gov.uk/priorities/business-economy/working-in-partnership/london-enterprise-panel/strategic-focus/economic-development-plan). For further information contact myfanwy.taylor AT gmail.com in the first instance. This entry was posted in Economy and Planning, Events by myfanwyt. Bookmark the permalink.